When we bought Cortado in 2014, we thought we would live on her for a school semester at most. We had no idea how much we would love her and the life we would build together on the water. 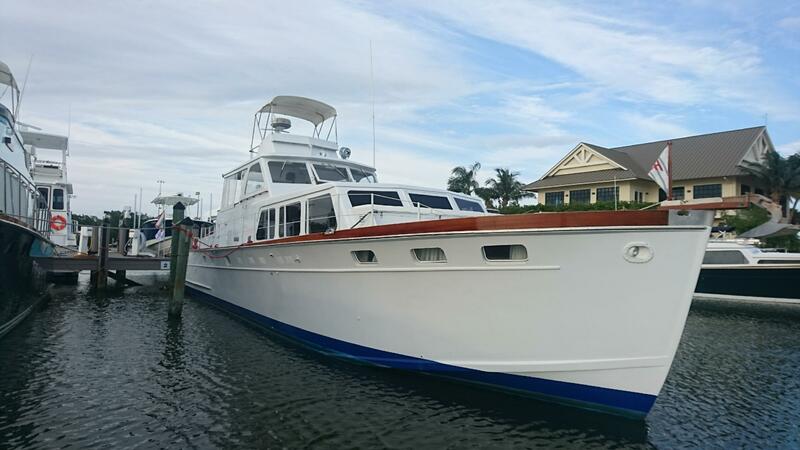 Fast-forward to 2017, we had to dig deep to make this next boat purchase a longer lasting fit for our needs. 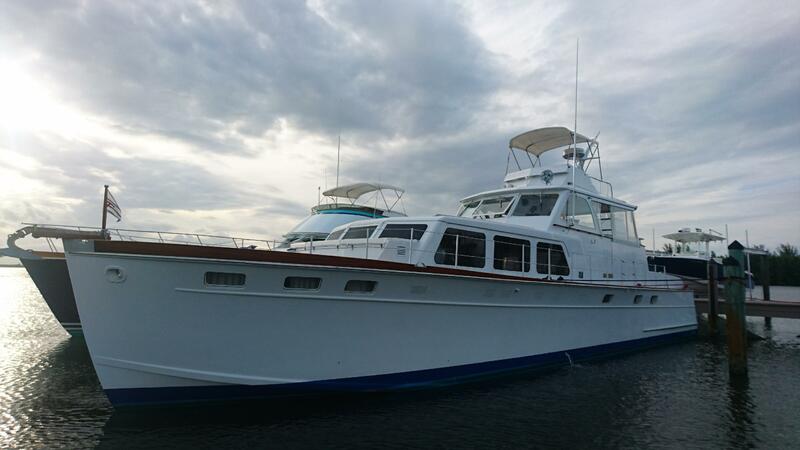 Cortado was the perfect starter boat for us: dependable, easy to use, manageable, affordable and plenty big enough. Then the kids started growing… (who knew?). After a great deal of online searching, flights, drives, showings and surveys, we found exactly what we were looking for. We asked for, and we found our Faith (yes, the boat was named FAITH!). 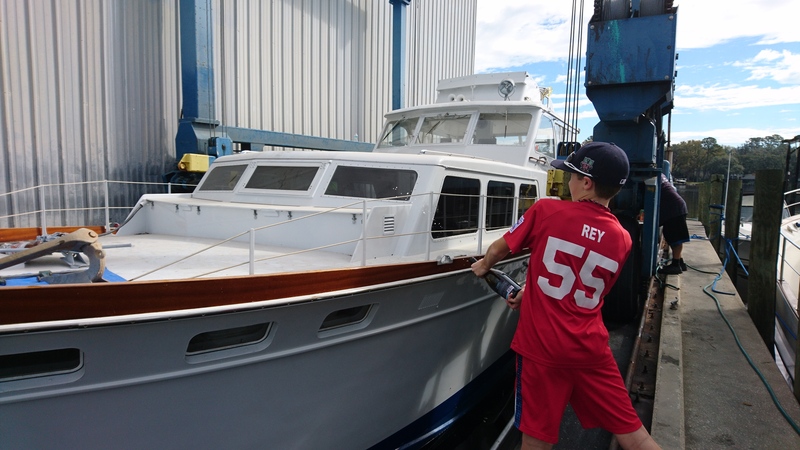 Our new Huckins is a 1966, 53′ Atlantic. She has been well-cared for, is nicely preserved and oh-so beautiful. 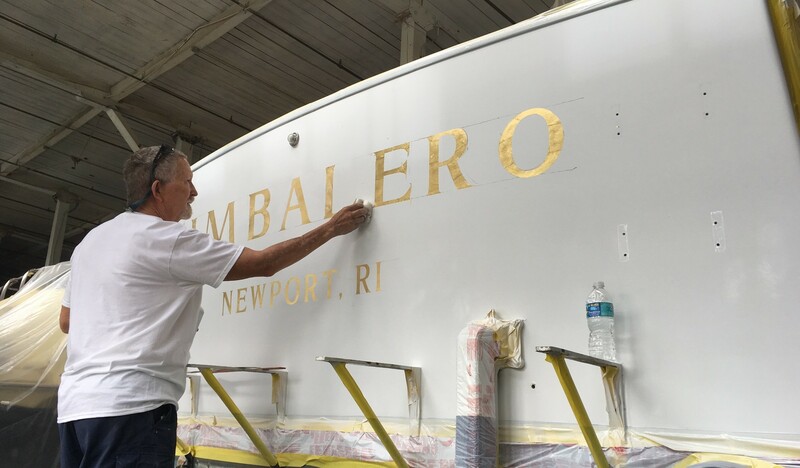 Hand-painting our new freedom flyer is the letter-perfect transom-artist Larry Dillon: one of very few hand-drawn, hand-painted boat-letterers out there; He is a talented artist. 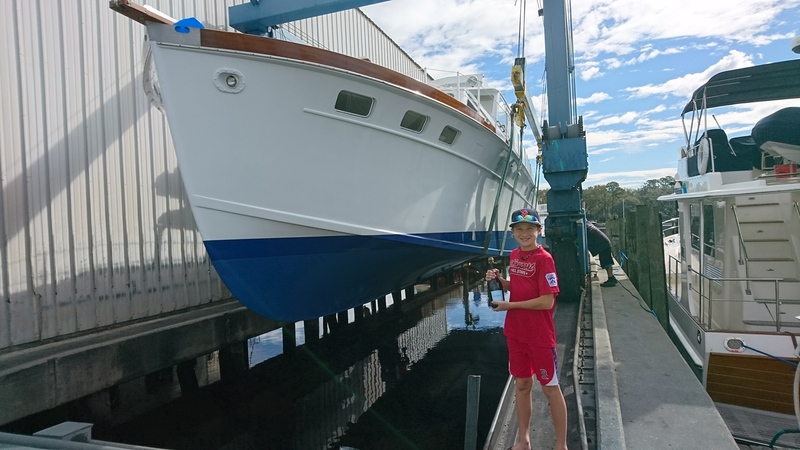 We have made a few modifications to the boat over the past few weeks, and she is now ready to launch. We are proud to embark upon the next chapter of our life’s adventures. We have a new family member! Our websites mvcortado.com and gotimbalero.com have been joined and are one and the same. Either URL address will land you here with us. Thanks to Sara Gielow and Buddy and Cindy Purcell (and all the dedicated staff) at Huckins for being so great to work with. Next Post Happy 2018 from the TIMBALERO crew! How exciting! New adventures await. Bon vent! Buen viento! Gracias Janis ~ We are super excited 😉 p.s. I ordered 3 copies of “Sail Cowabunga” from my local bookstore in Newport. I cannot wait to see the final product! Happy Holidays! She is ENORMOUS ! Looks So welcoming, comfortable and full of light inside.There is something very solid and reassuring about her. Congratulations and I wish you Buon Voyage on her. Would love lots of photos when you’ve settled in.